Tucked in between two mountains, Djanet seems at first glance to be a chaotic jumble of homes built one on top of the other up the side of a mountain with a lush green palmeraie at the bottom. 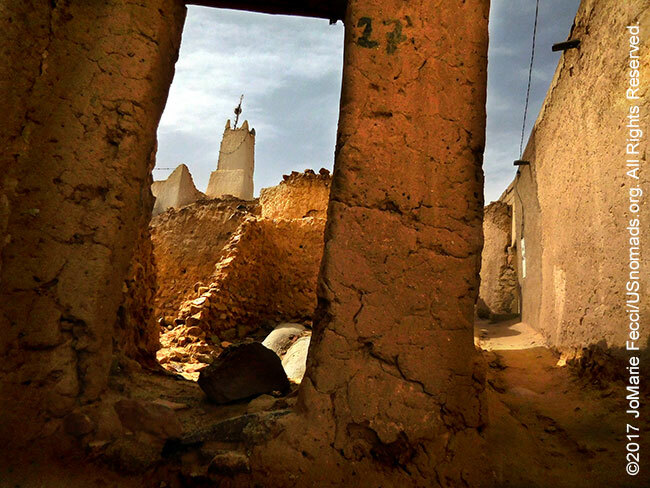 But behind this seemingly ordinary Saharan town lies the lunar landscapes of Tassili N’Ajjer which contain a collection of rock art and artifacts that vividly illustrate the Sahara’s historical progression from a lush green savannah to a harsh arid desert. Djanet is the gateway. Sadly, this gate had been pretty much “shut” in recent years. Direct flights from Paris and other major European airports to Djanet were cancelled after the 2003 kidnapping of tourists in the region. And the menace of terrorism against foreigners had caused the Algerian military to “close” the whole south-east of the country to independent overland travel by “westerners.” Though security concerns still exist, the military recently “opened” up the area around Djanet (with some restrictions), allowing us to move about freely. This quiet oasis town would be the starting point for our journey around the remote border region. 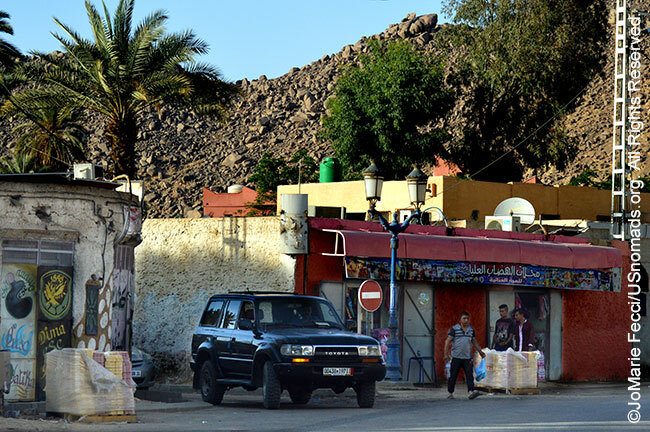 Driving in from the airport, the desert morphs into a sprawling suburb in stages of construction where small but neat block houses seem to be growing up out of the sand. Much of the construction is part of a government program that provides subsidized homes or a percentage of funding to help people build their own. The government has built two million homes across the country since 2008, and aims to build as many by 2019. But construction is still struggling to keep up with galloping population growth according to a New York Times report. The program is popular and vastly oversubscribed, with a seemingly endless wait for many applicants. Nationally, the average occupancy rate hovers at about 7.5 persons per household; with one report indicating that 52% of all households included 15 to 20 members. 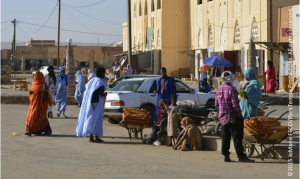 The central town of the Tassili region, Djanet counts roughly 15,000 inhabitants, mostly Kel Ajjer Tuaregs supplemented by a sizable group of young men at the nearby army base. The off-duty soldiers can often be seen in town but mostly stay among themselves and Djanet doesn’t have the feeling of being a “garrison town.” The distinctive culture of the Tuareg predominates, and it is more likely to hear people speaking Tamashak (the Tuareg berber dialect) than Arabic — though often it is a mix of the two. 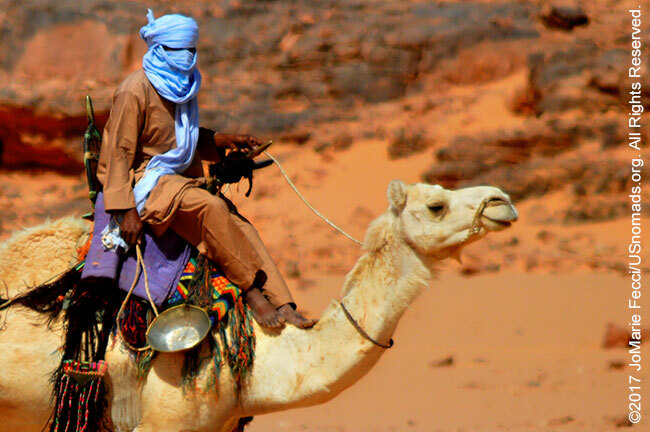 The Tuareg were for centuries nomadic pastoralists living across a vast stretch of the southern Sahara that includes parts of Libya, Algeria, Niger and Mali. In Algeria, the large majority are today settled in towns, and Djanet’s exponential population increase from 1,200 permanent residents in 1935 to 10,905 by 1993, is in part due to the sedentarization of nomads. 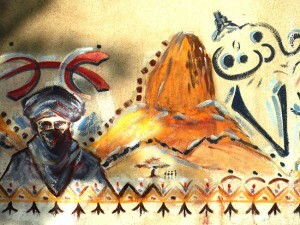 Djanet has grown in importance due to the touristic value of the nearby Tassili rock art. The main street is busy but not chaotic and there is little sense of urgency –– though there are speed bumps in the road to keep vehicles from driving too fast. Modern and tradition mix easily here. 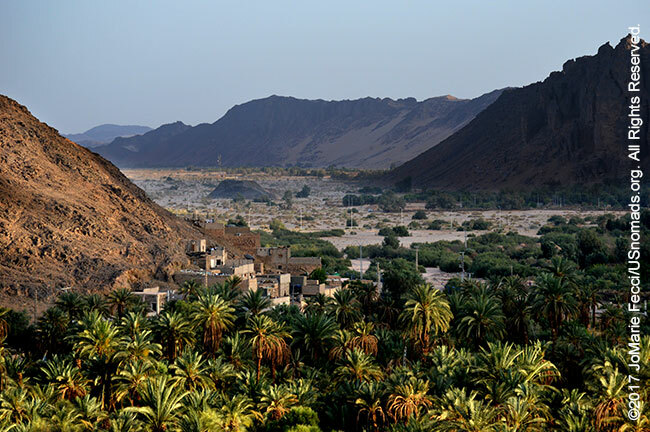 On one edge of town a solar farm harvests the sun’s rays, while on the other an ancient palmaraie is carefully cultivated for dates. Situated in a valley, Djanet is surrounded on one side by an almost vertical sandstone cliff that peaks at 1,200 meters, and on the other side by fragmented granite hills that are less steep but still reach the same altitude. In between is the oued Edjéréou, an ephemeral river that flows only in times of heavy rain, bringing water down from the Tassili plateau southward towards the dunes of Erg Admer. Local legend says that the name Djanet can be traced to the caravans that used to stop at this oasis to rest and feed their camels. The caravans would stay for some days, setting up their tents in the valley under the shade of the palm trees. According to the story, when one caravan was getting ready to pack up and move on, an old man and his young son could not find their camels. They went searching in the dense green of the palmeraie, and the boy called to his father, that he had found the camels. The father looked where the son was pointing, and seeing only more palm trees, ignored the boy’s direction. But the son, being smaller, could clearly see the camels kneeling in the shade between the palm trees, and he shouted again, “Neghtine Djanet” (“they are kneeling” in the Tamashak language). And so the oasis was called “Djanet” after the kneeling camels! The modern town is actually the conglomeration of three separate villages that grew up around the oasis, and expanded into one another. The villages were built on the two banks of the oued. Adjahil is to the south on the right bank surrounded by palm trees at the foot of the sandstone cliff. 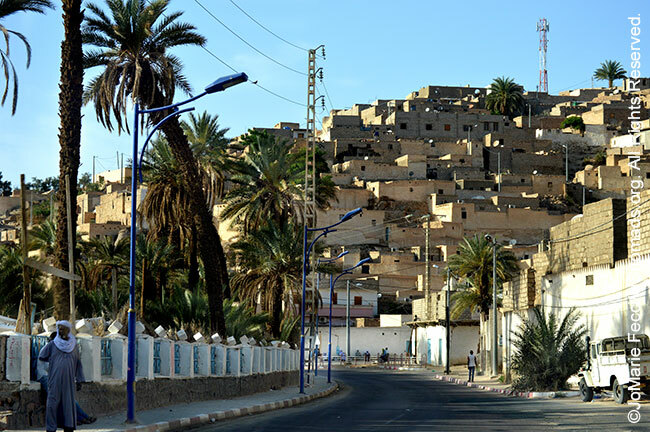 Azzelouaz was established on the left bank in the northern part of the oasis and El Mihane is halfway between the other two. Azzellouaz and El Mihane are built up into the side of the granite hills overlooking the palmaraie. In places they seem to almost be a part of the mountain itself and the height keeps them safe from the Edjriou’s flood. Local lore says there were once many villages at the bottom of the oued, and it was only after a series of catastrophic floods destroyed them that the people began building up the mountain. But putting their houses on the un-arable rocky hillsides also preserved the prime agricultural land for cultivation. Djanet produces dates, cereals and vegetables, but the agricultural production capacity is not enough to feed its growing population, and many basic necessities come from the north. 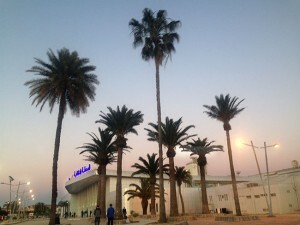 The Algerian government had encouraged the development of a tourism industry, beginning in the 1970s, to give the region an economic boost. And while no one could have foreseen the current “security situation,” the contradictions of an economy based largely on tourism, when tourists have been mostly blocked from coming here, is not lost on local residents. Some people feel that the government is preventing their region from reaching its economic potential with needless restrictions. Others shrug it off with an “inshallah, things will change soon, and the tourists will return.” Still others have started to look elsewhere for economic opportunity. 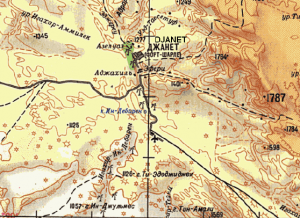 The earliest historical reference to Djanet on a map was in the 1790s where a French Major Rennel had marked it as “Jennet” or alternately “Ganatt” and placed it somewhere between Mourzouk (in Libya) and Agades (in Niger). The lack of European knowledge about Djanet was probably due to the fact that it was not a point on the great caravan routes, but rather off the “beaten path” in a generally inhospitable part of the Sahara. However, the town has a very long history. There is evidence of human habitation around this oasis since Paleolithic times. Rock art, artifacts and funerary monuments attest to man’s presence over thousands of years. But the first mention of the direct ancestors of the Kel Ajjer Touaregs — les Azgâr — is from the 10th century, when Ibn Hawkal mentions “les Banu Adjar-fazzan” a berber population who came south from the Fezzan to escape political-religious conflict as Islam spread across the region. The Ajjer are cited again, by El-Idrissi in the 12th century, where he describes the inhabitants of the Djanet oasis as poor semi-nomadic camel herders. Not long after, the situation changed when the oasis suddenly became important after trans-Saharan trade was interrupted by an offensive blocking the main eastern caravan route. The caravans were re-routed to the west with new crossroads at Djanet and Ghât. Some of the Ajjer were integrated into the caravan trade as guides and protectors for the valuable merchandise crossing through their territory. But Djanet never became a major commercial town because it was separated from Ghât by the wide Tassili plateau. The plateau was difficult to access and the terrain was dangerous, so the heavily loaded caravans preferred to circumvent it to the south, leaving Djanet an essentially rural agricultural town where nomads came to meet, trade and re-supply. 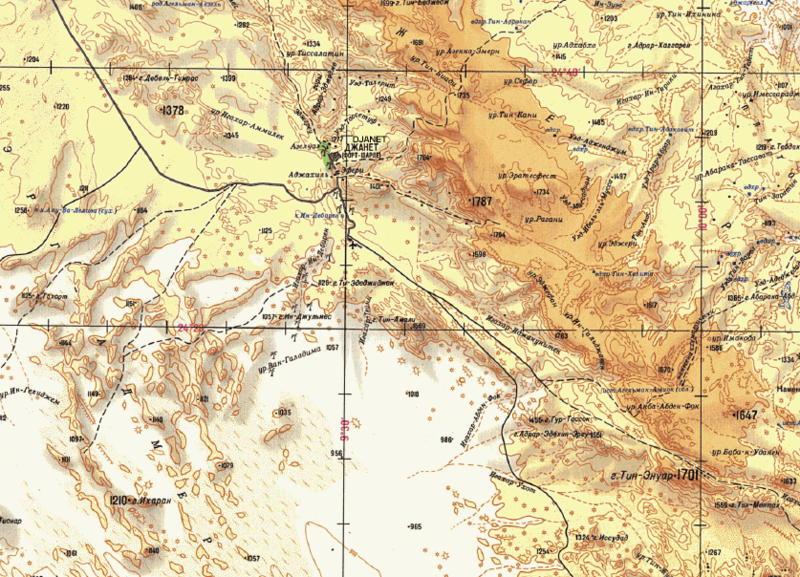 Some of the detailed topo maps we are using — tactical pilotage maps from the 1940s-50s — refer to the area as “Fort Charlet.” One of a series of military forts the French constructed across the Sahara in the early 1900s, it was situated on the top of the hill overlooking El Mihane. At that time, the oasis of Djanet was still a loose confederation of distinct villages and the French colonial territory was under threat from the Ottomans who had a base in Ghat (just across the Libyan border). France sent a company of méharistes under the command of Capitain Édouard Charlet to Djanet in 1911. Méharistes were camel cavalry units composed of 6 French officers, 36 French non-commissioned officers and troopers, and 300 local soldiers. They were tasked with patrolling the desert boundaries, administering local laws and reporting on the state of pastures in the fertile oasis areas. Their tribal links combined with the camels’ mobility allowed for flexible tactics, and the Compagnies Méharistes proved an effective means of policing the desert. In Djanet, Charlet’s camel cavalry took control of the oasis, and transformed the Senussi zawiya (a seminary and community centre of the Senussi Islamic sect, consisting of a mosque, classrooms, and living quarters for the brothers of the order) that dominated the area into a fort. Five years later, in 1916, cheikh Amoud Ibn Mokhtar, the Senussi leader who had been ousted by the French in 1911, returned to attack Djanet from Ghat. The 50 méharistes defending the fort held out for 18 days, until supplies ran out and they were captured by cheikh Amoud’s forces. In response the French sent a larger unit of roughly 1,000 men, who re-took the fort after several days of heavy fighting. The Senussis retreated back to Ghat, but continued to harass the French in the region, until 1920. After Algerian independence in 1962, the fort was replaced with a complex maintained by the Ministry of Tourism for official guests and other important visitors, and from the terrace there is an expansive view of the valley and the palmaraie below. Most prominent on Djanet’s skyline are the ruins of the ancient ksars. Ksar is the North African Meghrebi Arabic term for “castle” or “palace” and these old village centers remain in various states of ruin and restoration, mixed in to the middle of the modern town. It is disconcerting at first, to see crumbling ruins next to well-kept homes, but the strange mix is a function of the chaotic growth of the town — the residents left to build modern houses on the outskirts of town and just kind of abandoned the older area. Walking through the narrow alleyways of ksar Azellouaz in the late afternoon when long shadows fall on the rock-spill from half-fallen walls has an eerie feel. The winding pathways are littered with plastic bottles, tin cans, animal bones, and the stones from the decaying buildings. Yet there is an almost magical enticement to walk further into the maze, to see what is around the next corner, to climb higher into the thick clutter of rocks that was once a vibrant town center. Some buildings remain in tact, while others have completely caved in. Beyond the whitewashed minaret of the old mosque peeks above the rubble, still calling the faithful to prayer. Each “ksar” consists of houses centered around the mosque and the Zaouïa (a zaouia or zawiya is an Islamic religious school or monastery, similar to a madrassah). Other structures can include collective granaries, bath, oven, and shops. 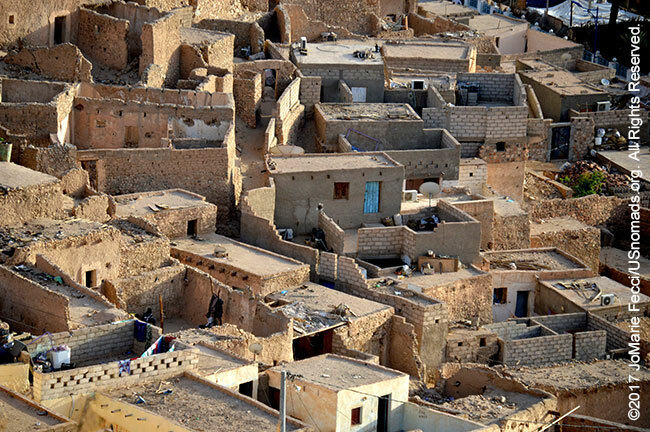 Ksars are typical of North African oasis towns and were often situated in hilltops to make defense easier. Azellouaz is tucked in between the rocks of the mountain itself, and sometimes it is hard to tell where the mountain ends and the buildings begin. The ksar of El Mihane is easier to distinguish because part of it has been restored. According to a representative of the local association working to protect and preserve the ksars, funding was provided to start the restoration process, but at some point stopped, and so the restoration has been halted. The main access to the restored section is behind a locked gate, but the association will unlock it for visitors. A walk through the restored ksar offers a contrasting view to the ruins, here we can see the functional layout of the old village center. The beauty of the sunlight and shadow on the walls, and the multilayered construction that leads to another magnificent view of the town and valley below. 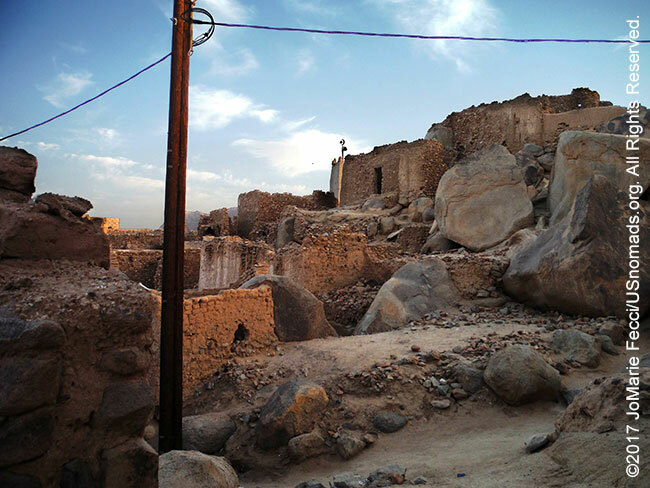 Seeing this ksar after visiting Azellouaz we can begin to understand the work involved in just “protecting” what exists. There has been an effort by some community members working with researchers, architects and universities, to sensitize the residents to the importance of preserving these examples of ancient urbanization for their cultural and historical value. 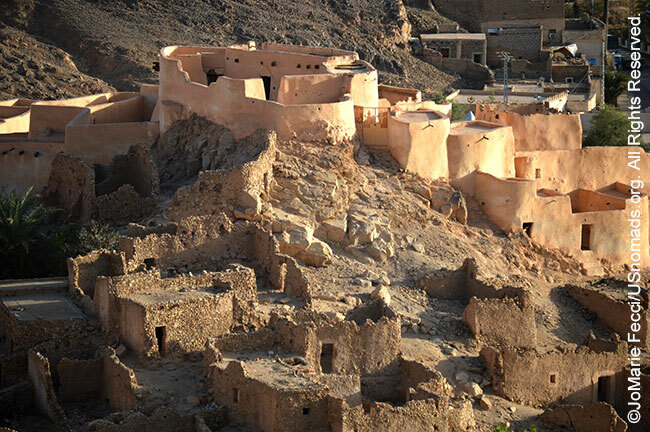 They would like to see new operations to restore and rehabilitate the ksar d’El-Mihane. They would also like to eventually enlarge the scope to Azellouaz and Adjahil. 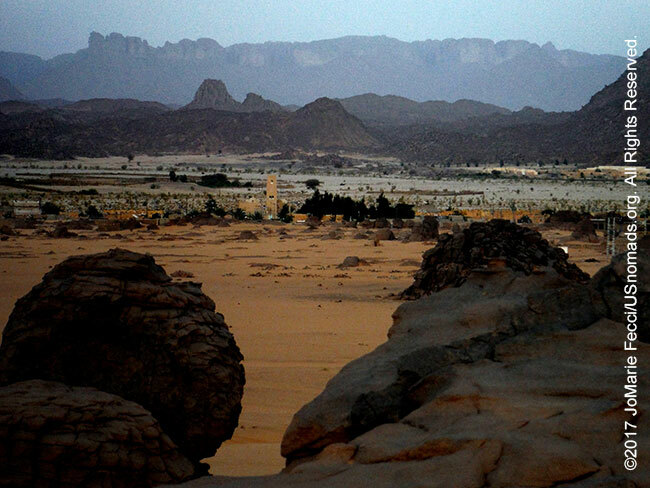 Djanet is in the extreme south-eastern corner of Algeria near the border with Libya and Niger, and is a Saharan desert oasis town tucked in between two mountains near the base of the Tassili N’Ajjer plateau. 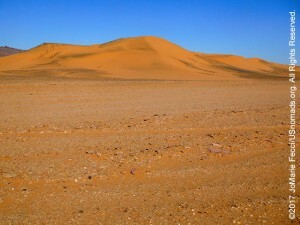 The low lying area is sandy desert, with a large sea of dunes to the west. 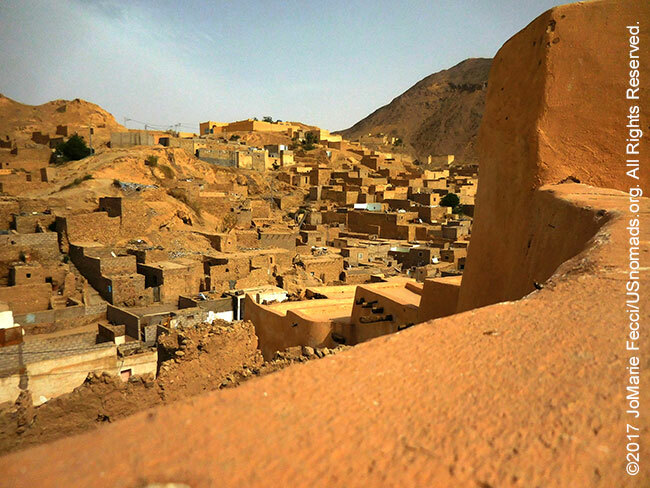 Djanet, and and its suburbs, lie in a valley carved by the intermittent river Oued Idjeriou through the southwest edge of the Tassili n’Ajjer mountain range. The town lies at an altitude of 3,396 feet (1,035 meters), but the mountains to the east and north reach as high as 6,250 feet (1,905 meters). We had no security issues during our journey, but western governments still maintain travel warnings for the southeastern region of Algeria. 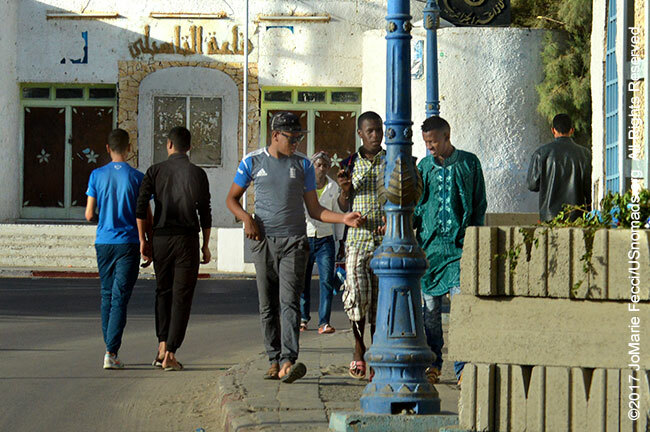 According to the US State Department Travel Warning for Algeria as of December 2016, there remains a high threat of terrorist attacks and kidnapping in remote areas of southern and eastern Algeria. However, major cities and touristic areas are heavily policed and most attacks are directed towards Algerian military or police, not tourists. The State Department recommends that U.S. citizens avoid travel within 50 km (31 miles) of the eastern border and within 450 km (280 miles) of the southern border and avoid overland travel across the Sahara. Travelers should remain on principal highways when traveling to coastal/mountainous areas east of Algiers and the mountains immediately south of Algiers. Foreigners should avoid staying overnight outside of the main cities and tourist locations, and make sure to inform local police when staying outside of major cities. Additionally, the Algerian government requires all foreign employees of foreign companies or organizations based in Algeria to contact the Ministry of Foreign Affairs before traveling in the country’s interior so that the Government can evaluate need for police coordination. In Algeria only a relatively small corner of the Sahara lies across the Tropic of Cancer in the torrid zone, but even in winter, midday desert temperatures can be very hot. After sunset, however, the clear, dry air permits rapid loss of heat, and the nights are cool to chilly. Enormous daily ranges in temperature are recorded. Prevailing winds that are easterly and northeasterly in summer change to westerly and northerly in winter and carry with them a general increase in precipitation from September to December, a decrease in the late winter and spring months, and a near absence of rainfall during the summer months. Djanet has a hot desert climate (Köppen climate classification BWh), with very hot summers and mild winters. The city is extremely dry throughout the year, with an annual average rainfall of just 14.6 millimetres (0.57 in). January has a very comfortable average high of 67°F 19°C and average low of 40°F (5°C), but summer temperatures average 100°F (38°C) high and 76°F (25°C) low, with a the record high of 120°F (49°C). 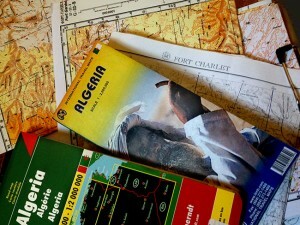 The Algerian portion of the Sahara extends south of the Saharan Atlas for 1,500 kilometers to the Niger and Mali frontiers. The desert is an otherworldly place. Seas of shifting sand dunes, know as “ergs,” cover about one quarter of the territory. The largest is the Grand Erg Oriental which is 600 km wide and 200 km from north to south. 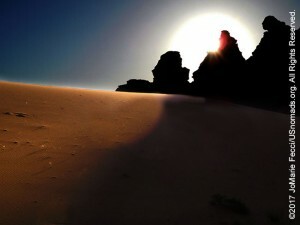 In other areas, the wind has removed the sand altogether leaving a bare rocky landscape referred to as “hamada” or gravelly terrain called “reg.” The southeastern quarter, where Djanet is located, is characterized by the high, complex mass of the Ahaggar and Tassili-n-Ajjer highlands, some parts of which reach more than 2,000 meters. Surrounding the Ahaggar are sandstone plateaus, cut into deep gorges by ancient rivers, and to the west a desert of pebbles stretches to the Mali frontier. The desert consists of readily distinguishable northern and southern sectors (the northern sector extending southward a little less than half the distance to the Niger and Mali frontiers). The north, less arid than the south, supports most of the few persons who live in the region and contains most of the desert’s oases. 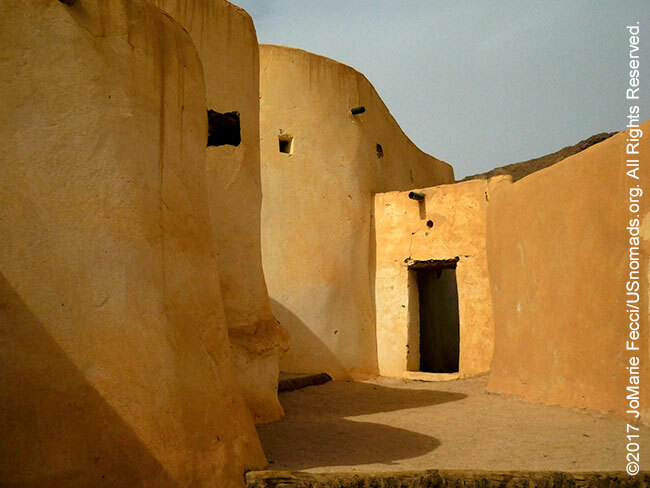 • The Taghaza Trail: One of the most important trade routes across the Sahara was to the west from the oasis town of Aoudaghost, near Fez in Morocco to the Atlantic coast near what is now Freetown in Sierra Leone. The route carried beads, ceramics, glass, oil lamps, saffron, dates, flour and salt south, and returned with slaves, kola nuts and gold. • The Darb el-Arbain route: The easternmost of the three central trade routes, known as the Forty Days Road. From Kobbei, 40 kilometres (25 mi) north of al-Fashir, the route passed through Wadi Howar to Egypt. In Egypt gold, slaves, ebony and ivory, were exchanged for ceramics, glass, oil lamps, silk, saffron and beads. • The Ghadames route: The westernmost of the three central routes, it ran from the Niger River at Gao north to Ghat and Ghadames before terminating at Tripoli. 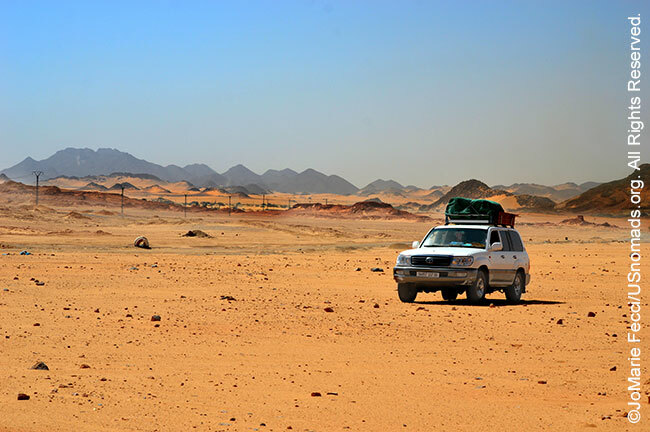 • The Garamantean route: Also known as the Bilma route, the Garamantean Road passed south of the desert near Murzuk then turned north to pass between the Alhaggar and Tibesti Mountains before reaching the oasis at Kawar. From Kawar, caravans would pass over the great sand dunes of Bilma, where rock salt was mined in great quantities for trade, before reaching the savanna north of Lake Chad. This was the shortest of the routes, and the primary exchanges were slaves and ivory from the south for salt. In addition there was an important west-east route from Walata to Timbuktu and through the Tenere Desert to Agadez, that then joined the north-south Bilma route. This route brought salt, kola, gold, ivory, and slaves in exchange for copper, ceramics, and cowrie beads. 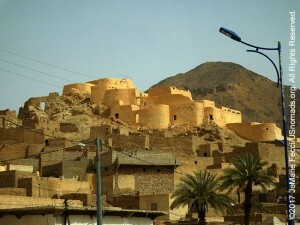 The ksar is a uniquely Berber architectural structure. These elegant, fortified villages made completely with mud brick or stone and adobe, were a distinctive form of collective residence. A ksar typically has high walls, orthogonal streets, a single gate and a profusion of towers. The communities were built near oases, but to preserve cultivatable land, they soar upward rather than build out. The surrounding walls are 6-15 meters (20-50 feet) high and buttressed along the length and at the corners by even taller tapering towers. Narrow canyon-like streets wind between, and the mosque and other public buildings are situated close to the gate which often faces east. There is very little ground-level space, but the upward building style allows for multiple stories, and the ksar has an easily defensible perimeter. Well-concepted for the desert, the design has a cooler micro-climate produced by low surface to volume ratios. The individual roof terraces provide space, light, and a panoramic view. The architecture of the ksar blends in well with the landscape. Historically, the ksar provided a fortified space where sedentary people could be protected from external attack. Typically it was inhabited by several family groups. In addition to the housing, it contained a “social” area centered near the mosque, which usually had a square, a hammam, and other important buildings, and then a separate “economic” area, where trading was done. “Earthen architecture is one of the most original and powerful expressions of our ability to create a built environment with readily available resources,” according to the UNESCO World Heritage Earthen Architecture Programmme (WHEAP). The variety of structures, and its appearance across cultures throughout the world truly shows a common heritage of humankind. However, these structures are increasingly threatened by natural and human impacts. Conserving and managing ancient historic centers, like the ksars, is a complex task. In addition to safeguarding existing structures, restoration needs to be conducted according to specific norms that maintain the authenticity of the site. Initial rehabilitation is undertaken to remove trash and debris, and local technicians must be trained for construction work using the traditional building techniques of the period. NOTE: This is the first in a series of segments highlighting details of a two-week scouting trip in the south-east of Algeria. All text and photos are copyright JoMarie Fecci/USnomads unless otherwise noted. If you would like to use any imagery here, please contact us for permission. The trip was conducted in April 2017 by JoMarie Fecci of US Nomads with a local Djanet-based team. For more information about the specifics contact us.